The day didn't start too well with a late start again. We just made it downstairs before breakfast finished, then headed off for our second day at Universal. The night before we were made aware of a Hurricane warning and when we woke it was raining heavily. Thankfully we had brought ponchos the day before, so we were set. We started our day at Terminator, then headed for the Transformers ride which was amazing. The day rolled on with many more rides and another trip to the Island of Adventure again so that Dylan could ride the Hulk rollercoaster AGAIN. Thankfully the weather turned but it was very humid and at least the rain had stopped. Liam wanted to do the ripsaw falls - not a good idea. We thought were were being smart by not putting on our ponchos - bad idea actually, we ended up absolutely saturated. It didn't really matter that much because by the time we had finished it had started raining again. As we were already wet we decided to do the white water rapids which was fun. 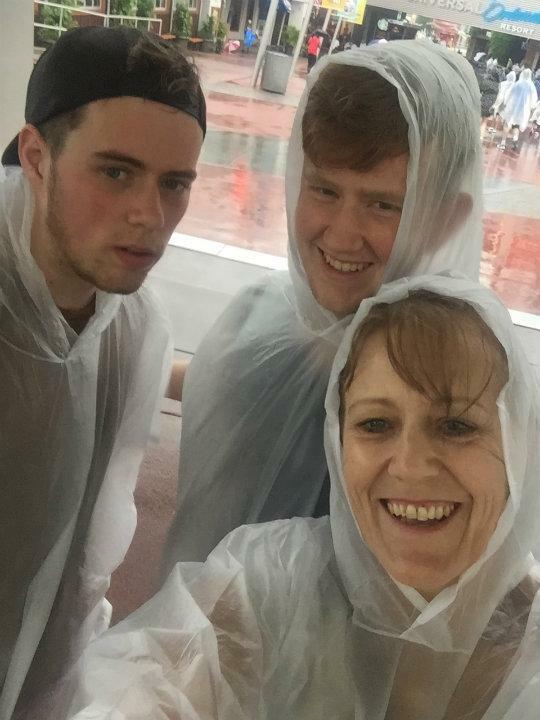 Dylan then went on the Hulk AGAIN in the rain, I just couldn't stomach it. I'd woken in the middle of the night before feeling like I was still on the rollercoasters so figured a quieter day would be better. The Island park closed so we headed back to Universal because we just hadn't had enough and we still had rides to do. Onto the Simpsons ride which was fun and then to do some shopping. By the end of the two days we had ridden every ride apart from Despicable Me. We headed out to Chilis for tea which was awesome and back in the room at 11.30 pm. Such a huge day, totally exhausted and the last thing I needed was to try and get some washing dry which is what I did at 12.30 am - I'm starting to get a clear picture there will be no early nights while we are here!! !